Discussion in 'Allied Light Weapons' started by warhistory, Oct 19, 2012. 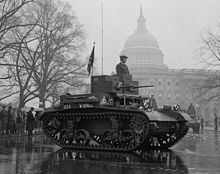 The M2 Light Tank was introduced in the America during World War Two. This tank was with US Marine Corps 1st Tank Battalion on Guadalcanal in 1942, during World War II. The operational range of this M2 Light Tank was quite impressive, which is about 320KM and the running speed of 58KM/h. This light tank served US Marine Corps, not only this. It is believed that this M2 served in Burma and India with the British 7th Hussars and 2nd Royal Tank Regiment during their engagements with the IJA 14th Tank Regiment.